Orthopedic surgery involves bones, joints, muscles, tendons, and ligaments. Fractured bones and torn ligaments are some of the most common injuries seen by the veterinary surgeon. In many cases, there are multiple injuries to the pet often as the result of trauma. 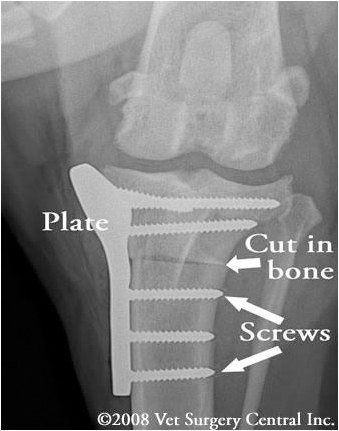 Advanced techniques including the use of steel plates and screws or elaborate bone pin and clamp systems are required to adequately stabilize these injuries so that the pet can heal normally. Additionally all patients are supported intra-operatively with intravenous fluids appropriate for the pet’s condition. The stifle joint (in layman's terms called the knee) of the dog is similar to a human’s knee. The cranial cruciate ligament is located inside the joint and is responsible for maintaining a stable joint. One of the important functions of the ligament is to prevent forward and backward sliding of the femur on the tibia bone (drawer motion). The cost of TPLO surgery can vary depending on who and where the surgery is being performed. The average cost ranges from $2500 – $4500. The cost depends on the veterinary surgeon and hospital. The cost may include pre-surgery bloodwork, anesthesia, the surgery itself, post surgery care and medications. Some hospitals may even include post-surgical physical therapy. When the femur bone shifts backwards the femur bone pinches the medial meniscus, causing it to tear from the back part of the stifle joint and flip forward. Put your cursor over the illustration to the right - take note that as the femur bone shifts backwards the back horn of the medial meniscus tears and flips forward. Additional images from arthroscopy of a stifle joint. Image below left of grossly normal meniscus (mild curl of the edge of the meniscus is normal). The image below right is a partially torn cruciate ligament. The tibial plateau leveling osteotomy - TPLO involves making a curved cut in the top of the tibia bone (osteotomy) to include the tibial plateau. The tibial plateau is then rotated along the curved osteotomy in order to level the slope. A plate and screws are used to hold the tibial plateau in place so that the bone can heal in its new position. Below left is radiograph of a stifle before TPLO surgery and below right is a radiograph demonstrating the curved cut in the tibia bone and rotation of the the tibial plateau. Take note of the metal plate and screws that hold the bone together. The tibial plateau should not be leveled to 0 degrees or less as this will strain and potentially tear the caudal cruciate ligament. One research study indicated that dogs that had a postop tibial plateau angle between 2 and 14 degrees clinically did very well, however the original recommendation by Dr. Slocum is 5 degrees. The canine knee joint, known as the stifle joint, is similar to a human’s knee in many regards. The joint is made up of the meeting of the femur (thigh bone), tibia (shin bone), and the patella (kneecap). The cranial and caudal cruciate ligaments (CCL), medial and lateral collateral ligaments, and the patellar (kneecap) ligament hold these bones in place. Ligaments are strong, dense structures consisting of connective tissue that connect the ends of two bones across a joint. The function of ligaments is to stabilize a joint. The CCL plays a critical role in stabilizing the stifle (known as the knee in humans) against front-to-back forces. It prevents the tibia from shifting in front of the femur, controls excessive internal rotation of the joint and hyperextension, and is the structure most commonly injured. In fact, more than 600,000 dogs in the U.S. have surgery for this problem every year. The top of the tibia that is in contact with the bottom of the femur is angled and sloped toward the back of a dog’s leg. When the CCL is torn, weight-bearing movement causes the femur bone to slide down this slope. Not only is this painful, but also causes the stifle to “give out” during weight-bearing. As the femur slides down the slope of the tibia, the meniscal cartilage—a cushion between the bones that acts as a shock absorber may be crushed. 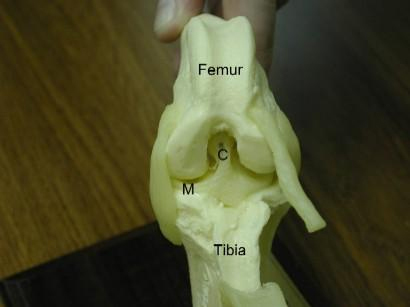 In about 50% of the dogs with CCL injuries, the meniscal cartilage has been injured as well. This type of injury is often accompanied by a “click” that can be heard when a dog walks. When the CCL is weakened or torn, the most significant long-term change in the joint is the development of arthritis. All joints with instability will develop arthritis; however the severity and the effect of the arthritis will vary from dog to dog. Most dogs with a complete CCL tear show an immediate onset of lameness. While there may be some initial improvement over several days, there usually is a dramatic decline in limb function over time. There is no benefit gained from taking a “wait and see” approach. Stabilization of the joint soon after the injury has occurred is recommended. In small dogs, nylon bands can be used to tighten the knee, however, this technique usually is not consistently effective in large breeds. 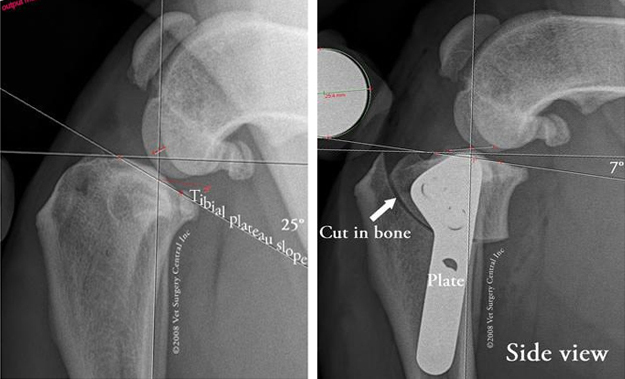 There are two main types of surgery that are recommended for medium and large breed dogs that have CCL tears: the tibial tuberosity advancement (TTA) and the tibial plateau leveling osteotomy (TPLO). The TTA is a somewhat less invasive surgery and gives similar results to the TPLO. Dogs that receive the TTA procedure will recover quicker initially, however, by 4 months after surgery both procedures have similar outcomes. The TTA procedure should not be used in dogs that have a steep tibial plateau, therefore your dog’s surgeon will make a decision which procedure is the best option for your companion. The TTA procedure involves making a cut in the front part of the tibia bone (tibial tuberosity) and advancing this portion of bone forward in order to realign the patellar ligament so that the abnormal sliding movement within the knee joint is eliminated. A specialized bone spacer, plate and screws are used to secure the bone in place. Bone graft is collected from the top of the tibia and placed in the gap in the bone to stimulate healing. Now this will seem complicated when you look at the forces that are applied to the knee, but let me try to explain. There are opposing forces that affect the stability of the knee. The forces that come from the patellar ligament (from the pull of the quadriceps muscles), Fq, oppose the other forces applied (Fn and Ft). 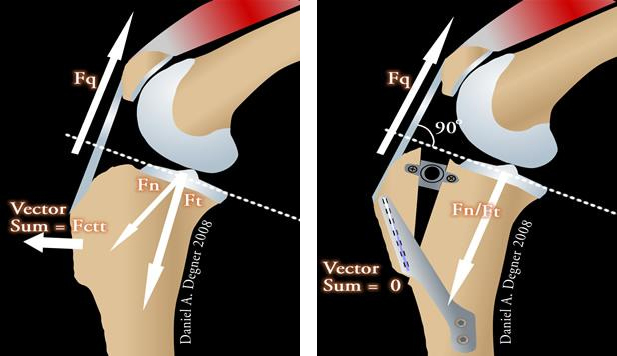 Because the patellar ligament is angled greater than 90 degrees to the top of the tibial slope (dashed line), there is a resultant shear force that causes the tibia bone to slide forward with weight-bearing; this force is normally neutralized by the cranial cruciate ligament. However, when the cruciate ligament is torn, this force causes the knee "give out" with every weight-bearing stride. 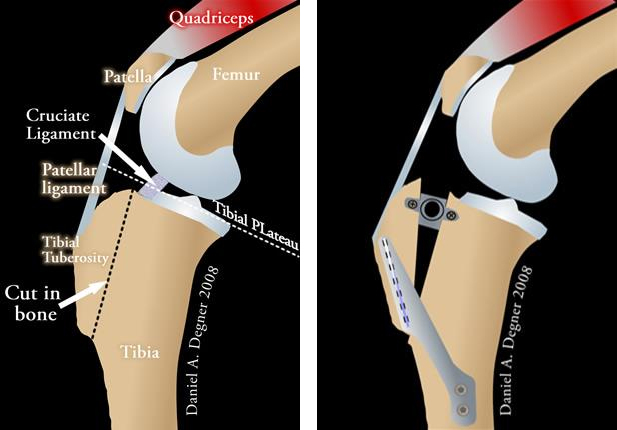 After the TTA procedure has been completed, the angle of the patellar ligament approaches 90 degrees to the tibial slope and the opposing forces become cancelled, thus the tibia bone remains in place when weight is placed on the limb. After surgery, you can continue to give your pet a prescribed pain reliever to minimize discomfort. It’s also extremely important to limit your dog’s activity and exercise level during this post-operative period. Rehabilitation exercises can be done at your home or if you choose, by professionally trained therapists at an animal rehabilitation center. Rehabilitation therapy should be continued until your dog is bearing weight well on the operated limb (typically 8 weeks after surgery). Detailed instructions will be given to you after the surgery. The healing process will be monitored by the surgeon with two follow-up exams. The first is scheduled at two weeks after the surgery and the second is at eight weeks after the surgery. By 8 weeks after surgery, the bone will be healed together. By 16 weeks after surgery, most dogs are fully weight-bearing on the operated limb, and exercise restrictions can be lifted at this time. Complications are possible following TTA surgery; however, as the surgeon performs more and more of these procedures the complication rate also will decrease, but will not be totally eliminated. Anesthetic reactions are uncommon and rarely result in mortality under the care of trained specialists. Although infection may develop in the surgical site, this is uncommon, as strict sterile technique is used during the surgery. If your dog is receiving medications such as chemotherapy or steroids, the bone may not heal well, therefore it is imperative that you inform the surgeon prior to surgery that your dog is receiving these medications. Over activity in the postop period may also result in poor bone healing, loosening of the screws or breakage of the implant. In addition, if your dog falls, the tibia may fracture. Arthritis (bone spurs) is usually present at the time of diagnosis of a cruciate ligament rupture and likely will progress regardless of surgical procedure performed. At this time (Jan 2008) there is no report that demonstrates that the TTA procedure will slow the progression of arthritis. If the arthritis progresses, medications can be used to help relieve these signs. 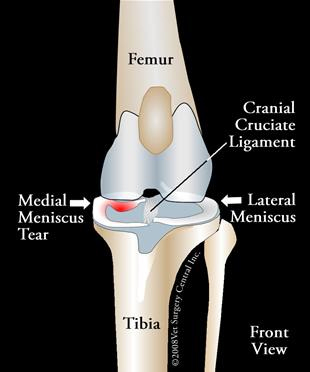 Reports indicate that there is about a 9 to 10% risk of developing a meniscal tear after TTA surgery (another report demonstrated greater than 20% meniscal tears), therefore most surgeons perform a meniscal release at the time of the surgery to prevent this complication. In comparison, only about 2% of TPLO cases develop a meniscal tear after surgery (with no meniscal release being performed). If the patient develops an infection in the surgical site and the implants need to be removed it can be a total nightmare for the surgeon to remove the implants. The cage that is frequently embeded in the bone will require drilling of the bone to remove it. The TTA and TPLO procedures offer multiple benefits in comparison to older techniques which include: faster recovery, earlier use of the limb after surgery, better chance to return to full activity, and better range of motion of the joint. The TTA and TPLO procedures are currently the best methods available for stabilizing a dog’s knee. At the time of this writing (Jan 2008), no study demonstrated that working dogs receiving the TTA procedure will return to their peak athletic performance. Until supportive data comes out, I still recommend the TPLO surgery for athletes (agility, hunting, police dogs etc). In addition, I would not recommend this procedure for show dogs for two reasons: first, the tibial crest protrudes more, therefore a short-coated dog will have a visible difference in the appearance of the operated limb; second, following TTA surgery, the dog may walk with the stifle in a more flexed angle. Overall, the TTA appears to be a good treatment option for dogs that have ruptured the cranial cruciate ligament. When should my dog have the first bowel movement after surgery? My pet had surgery and will not eat. What can be done? Most pets will not eat their regular dog food after surgery, especially if it is kibble. Offer a cooked diet having a 1:1 ratio of a protein source and carbohydrate source. The protein source can be any meat (example: chicken breast, turkey breast, lean hamburger) that is low in fat and should be cooked (drain off all fat after the meat has been cooked). The carbohydrate can be pasta, potato or white rice. Warm the food slightly in a microwave, as the food will be more aromatic; stir the food before feeding and test the temperature on the bottom side of your wrist; it should only be luke warm. My pet is vomiting. What can be done? The first thing for you to discern is whether your pet is vomiting or regurgitating. Both will result in fluid or food being brought up. Vomiting always will have heaving or retching of the abdomen prior to expulsion of the vomitus. Regurgitation is not associated with heaving and the pet usually just opens the mouth and fluid or food will be expelled. Usually the regurgited material will be clear or brown colored fluid. Next is to identify the cause of the vomiting or regurgitation. When some pets return home after a stay in the hospital they may drink excessive amounts of water at one time and then vomit; if this appears to be the case, the water should be limited to frequent smaller amounts. Medications such as antibiotics, narcotics or nonsteroidal anti-inflammatory medication commonly cause vomiting after surgery. In order to see which medication is causing the problem, the administration of each drug should be separated 2 hours apart. Usually the pet will vomit or appear nauseated (drooling and sick look) within 1 hour of administration of the medication that they are sensitive to. The antibiotic in some cases may be changed to a different one, or may be discontinued. Stomach upset from anesthesia is a potential cause of vomiting and will pass within a couple of days. An uncommon cause of vomiting after surgery is internal organ failure. Blood testing will confirm this problem. For this reason vomiting should not be ignored if it persists for more than 24 hours. If your pet had surgery of the bowels or stomach, vomiting is always a concern, as it may indicate that infection of the abdominal cavity, called peritonitis, is present. Do not ignore this sign. Symptomatic treatment of vomiting involves withholding food for 12 to 24 hours, then introducing small amounts of bland food such as rice and lean cooked hamburger, if your pet does not vomit after that then gradually wean him/her back onto the regular diet after 3 days. In order to decrease the acidity of the stomach, Pepcid AC 0.5 mg/kg can be given by mouth twice daily for 5 days. Metoclopramide and Cerenia are good anti-vomiting medications for dogs and cats. You should always consult a veterinary healthcare professional before administering medication. The most common cause of regurgitation is reflux of acid from the stomach into the esophagus while your pet is under anesthesia. Acidic fluid from the stomach can cause a chemical burn of the esophagus and result in a bad case of heart burn, called esophagitis. This results in poor motility of the esophagus, therefore water and food will accumulate in this structure. In most cases, esphagitis is self-eliminating and will resolve within two or three days. If the esophagitis is severe the esophagus may develop one or more strictures. A stricture is a narrowing or stenosis of the esophagus and does not allow passage of food down the esophagus, in regurgitation that lasts longer than one week. This problem should be brought to the attention of your pet's doctor within the first two weeks so that it can be treated by ballooning the stricture (minimally invasive procedure, as it is done with the aide of an endoscope). If an esophageal stricture is chronic surgery is needed. Symptomatic treatment of regurgitation caused by esophagitis includes feeding bland food, and administering a coating agent (sucralfate) and an acid blocker (omeprazole or other). Consult a veterinary health care professional if the regurgitation continues for more than a couple of days. How do I know that my dog is in pain following surgery? What can I do to control my dog's pain? A cold pack may be a pack of frozen peas, crushed ice in a Ziploc bag, or a cold gel pack; place a thin barrier between the skin and the cold pack. An alternative to a cold pack is to freeze water in a styrofoam cup; after frozen cut the bottom of the styrofoam cup out. Cool the surgical site around the incision by rubbing the exposed ice directly on the skin in a circular pattern. Cooling the surgical site helps to numb the area. How do I know that my cat is in pain following surgery? What can be done for pain at home for my cat? Is it okay for my pet to lick the incision? A tee shirt can be used to cover an incision on the chest or front part of the abdomen; gather the waist of the shirt up over the dog's back and wrap an elastic band around this part of the shirt. A bandage or sock can be used to cover an incision on a limb; fasten the top of the sock to the dog's limb with tape. Many factors enter into the decision to have a total hip replacement performed on your pet. You may have questions about the procedure. The answers to the most commonly asked questions about total hip replacement follow. We hope you find this information helpful and would be happy to answer any other questions you might have. Q: What is a total hip replacement (THR)? Both the ball (head of the femur) and socket (acetabulum) of the hip joint are replaced with prosthetic implants. The new ball is made from a cobalt-chromium metal alloy and the new socket from high molecular weight polyethylene plastic. Special bone cement is used to hold these implants in place. Q: Do you use a cementless or a cemented total hip replacement? We have been doing cemented total hip replacements at The Ohio State University College of Veterinary Medicine since August of 1976. We have gained considerable experience with this procedure and have a high success rate. The prosthesis we use has many of the design features found in hip replacements used in people. It is commercially available and in wide use through out the world. Total hip replacements that do not use cement are commercially available for dogs. To date, these commercially available cementless implants confer no significant advantage to the patient in the short or long term. In future it is possible that technological advances in cementless THR will allow us to recommend such implants, or a hybrid combination such as a cementless cup and cemented stem. Q: Can you tell from my dog's x-rays (radiographs) if he/she is a good candidate for THR? Radiographs show abnormalities in the hip joint and are used for choosing the proper sized prosthesis but they are only part of the picture. To decide what is best for your pet, the surgeon must evaluate your pet's history, perform a complete physical examination, evaluate your pet's radiographs and interpret laboratory data. Many factors must be evaluated before your pet is considered a good total hip candidate. Q: How do you determine if my dog is a candidate for a THR? A painful hip(s) that is affecting your dog's comfort, locomotion and activity levels is the primary indication for a THR. Stiffness, lameness and reluctance to exercise are often signs of problems. Your pet must be in good general health. There must be no other joint of bone problems, no nerve disease, and no other medical illnesses. Your dog must be skeletally mature; that is, he/she must be finished growing. Generally this occurs by 9 to 12 months of age. This is determined by x-rays of the hips. The size of the bones as determined by x-rays must be large enough to fit the available sized of prosthesis. Total hips can generally be placed in dogs weighing 40 pounds or greater. A dog with arthritic hips that has pain-free, normal function is not a candidate for THR. Q: What is the earliest age my dog can have this procedure done? In most dogs 9 months old is the earliest the procedure will be done. There are only a few giant breeds where it will be necessary to delay surgery for 1 or 2 months while the dog's skeleton reaches maturity. Q: What can I expect from this surgery? The goal of surgery is to return your pet to pain-free, mechanically sound, normal hip function. Generally, dogs are found to be more comfortable and have an improved quality of life. Many owners report that their pet can do things they have not done since they were a puppy. Increase in muscle mass, improved hip motion, and increased activity levels have been observed in most patients. Working dogs have returned to full activity. Some mean dogs have even developed a pleasant personality when the pain was eliminated from their hip(s). We have found that 95% of the hips that have been replace by surgeons at OSU return to normal function or near normal function. More than 95% of owners feel that their dog's quality of life is improved or markedly improved. Q: Since the expertise of the surgeon is very important, what experience do the surgeons at Ohio State have with the procedure? In 1976 surgeons from Ohio State began evaluating the effectiveness of this procedure. This evaluation continues today. Since the first hip was put in, over 2,000 total hip replacements have been performed by surgeons from Ohio State. More canine total hips are done at Ohio State each year than at any other university or private practice in the world. Surgeons at Ohio State have been leaders in developing and writing about total hip replacement surgery. Owner and referring veterinarian cooperation in providing follow-up information has been invaluable in the effort to evaluate and continually improve this procedure. Q: My dog is on medication. Should I stop giving this? Medications for health conditions such as diabetes or low thyroid function should not be stopped. Medications for hip pain should be stopped prior to the initial examination. Oral steroids (even for skin conditions) should be stopped 1 week before the exam while other anti-inflammatory drugs including aspirin should be stopped 3 days before the exam. Q: Is surgery performed the day of admission? No. Your pet must be carefully screened before surgery. This entails a complete history and physical examination. X-rays of the hips will be taken pre-operatively. A complete blood count and chemistry profile (if indicated) will be obtained to screen your dog for evidence of infection, anemia or problems with internal organs before surgery is performed. Your pet's skin will be carefully examined for signs of infection. Abnormalities noted on these examinations may indicate that your dog is not a good candidate for a THR. If the pre-operative evaluations reveal no abnormalities, surgery is usually scheduled for the next day. Q: How long will my pet stay in the hospital? The routine length of hospitalization for patients with THR is 3 to 5 days including the day of the initial examination. If it is determined that your pet is a good candidate for the procedure and you agree to have the procedure done, he/she will be admitted to the hospital at the initial examination for surgery the next day. Q: What is the success rate of THR? In reviewing the records of patients that have had THR, a little over 95% of dogs have had good to excellent function with this procedure. These patients have normal pain-free function, increased muscle mass, no limping and increased activity. Q: What are the complications with this surgery? As with any surgery, total hip replacements have their own set of complications. The complications that have occurred since 1976 when the first THR was done at Ohio State include dislocations, fractures of the femur, infections, loosening of the implants and nerve damage. Because surgeons at Ohio State have been continually evaluating and improving this procedure, the risk of a complication occurring is low. Some complications seen in the early stages of development of the technique have been totally eliminated, while the risk for other complications has been greatly reduced. Methods of treating the few complications that do occur are also being developed and evaluated. Most complications can now be successfully resolved, preserving the THR. Thus, in the unlikely event your dog does have a complication, it is best to have it dealt with by a surgeon at The Ohio State University. Q: What is the post-operative care for my dog? The postoperative care for your dog is critical. The surgical incision must be monitored daily for redness, swelling or discharge. Your dog must be discouraged from licking the incision. This sometimes requires placement of a special collar to prevent your pet from reaching the incision. Your dog's attitude and appetite should be monitored daily while the incision heals. The sutures may be removed 10 to 14 days after the surgery. This may be done by your local veterinarian or at Ohio State. An appointment for suture removal is required at Ohio State. The activity level of your pet must be strictly controlled. For the first month after surgery your dog should only be allowed outside, on a leash, to urinate and defecate and for a short walk. Your pet should be immediately returned to the house afterwards. Inside the house your pet should avoid stairs and slippery floors. If your pet must go up and down some stairs, you should go with the pet using a leash or your hand on the collar to control the speed of your pet on the stairs. Good footing is important. Absolutely no running, jumping or playing is allowed in the first 2 months after surgery. When your dog is not under your direct control, he/she should be kept confined to a small room. Some owners find that a large cage or airline crate is an ideal place to confine their pet when they are not at home. For the second post-operative month, similar restrictions apply but you may begin to take your pet on longer leash walks. The length of the walk will depend on your dog's abilities. After the end of the second month, you may return your pet to full activity. Q: Do I have to bring my animal back to Ohio State for a check up? If possible we would like to reevaluate our patients at OSU. We understand that people come to us from all over the United States, so if it is not convenient for you to return to OSU, we ask that you have your veterinarian x-ray your dog at 3 months after surgery and annually thereafter. We also ask that those x-rays and a report on your pet's function be sent to us so that we may record that information in your pet's medical record. We have been able to follow some dogs for more than 12 years. We will only be able to evaluate long-term results of THR if we have the cooperation of owners and referring veterinarians. Q: Both of my dog's hips are affected. Will both need to be replaced? How do you decide which hip to replace? Four out of five dogs or 80% of the patients with arthritis in both hips only require one side be operated upon to return them to a satisfactory and comfortable life. The decision on which hip to replace is based on the owner's observations, the physical examination findings and the hip x-rays. Your knowledge of your pet's disability is important in making this decision. At present (2013), the average cost ranges from $4,400 to $4,700. This includes the examination, laboratory work, x-rays, hospitalization fees, antibiotics, anesthesia, surgical fees, special surgical drapes and the cost of the implants (which accounts for about 35% of the fee). Charges for follow up evaluations range from $200-$300. These costs vary, depending on what needs to be done. We at Ohio State are doing everything we can to keep the costs of this procedure low. However, as the costs of the implants and materials we use in the procedure increase, we may have to raise our fees, thus the price range given above is subject to change without notification. Q: How do I make an appointment for THR? In many cases, your veterinarian will have recommended a THR. Your veterinarian may have already consulted with Ohio State about your pet. An appointment is made with an orthopedic surgery service at The Ohio State University Veterinary Medical Center. These can be made by calling the small animal appointment desk at 1-614-292-3551. Appointments are for mornings only, Monday through Thursday. These appointments may take 2 to 6 hours. The day of the week for your appointment will vary depending on the surgeon's clinic schedule. Q: Is THR the only treatment available for my pet? No, besides THR, other possibilities for treatment of your pet include non-surgical therapy and several other surgical options. Which treatment should be used on your pet depends on many factors. The best treatment option will be discussed with you after we have taken a history, evaluated x-rays, and completed an orthopedic examination of your pet. We hope we've answered your questions about total hip replacement. If you do have other questions, please be sure to ask them at the time of your appointment. Your veterinarian is welcome to call OSU to discuss case management with an orthopedic surgeon.